Metaphorically speaking, young girls have the passion, the energy and enthusiasm to plant the seeds of Love and of Compassion, of mutual understanding and of being together, as sisters and companions. I just visited Ngara Girls’ High School, in Nairobi, Kenya for a raising awareness and advocacy initiatives of Trees Planting and Clean up #BeatPlasticPollution. The visit was to mark the United Nations World Environment Day 2018, whose message is to protect the environment by gathering communities and by working together to beat the use of plastic worldwide, and to learn how to recycle and reuse waste ( waste management). I was impressed by the discipline, the smiles and the excellence of Ngara Girls High School students, 1300 girls- studying and living there in dormitories- the so-called boarding schools, from Form 1 to 4, and preparing the exams to enter the most prestigious universities in Nairobi, from Mount Kenya University, to University of Nairobi, Strathmore University and Kenyatta University. The motto of the “ladies of substance”, the young girl students is “Honor and Effort” & the core values of the school are: Fear of God, Team Work, Professionalism, Integrity and Self-Drive. With Soroptimist International, a network of women professionals coming from all over the world and specialized in all diverse subjects, I had the opportunity to give a motivational/leadership and some inspirational pills to all these young women, who are the future of this continent Africa and who are willing to change the paradigm of society by reaching gender equality, being economically and socially independent, by achieving their hopes and dreams and by unleashing their potentials and be exactly who they want to be. Aspirations and Dreams become reality if you believe in them. You need to inspire and be inspired. Every day, And, as i shared with them, Know Thyself- Know Yourself, as great Greek philosopher Socrates used to say. We are constant human beings in progress, learning something new every day, with the ability to study and reach out to others to share experiences and ideas. Collaborative ideas and teamwork expand to a virtuous circle of love and understanding, empathy and collaboration. 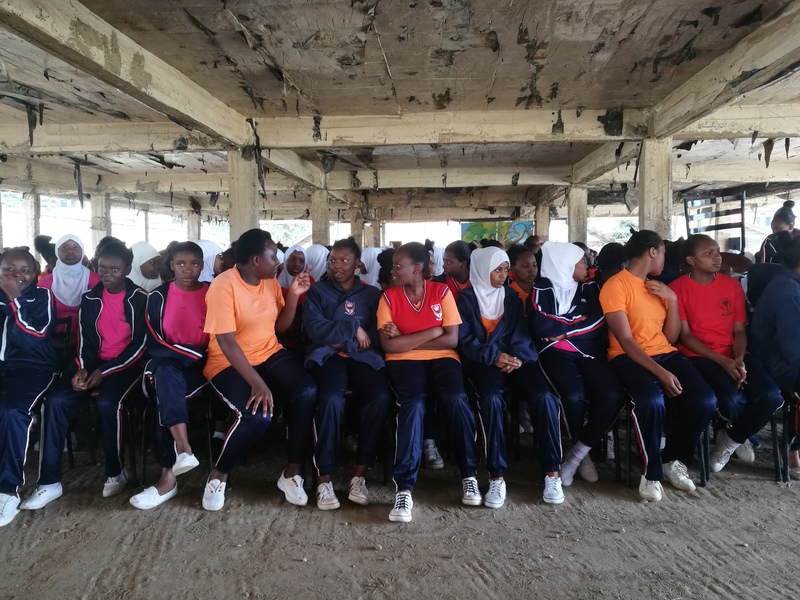 As the principal of the Ngara Girls’ High school said “We have two assets in our life: Time and Actions”. We need to use our Time wisely to make a contribution to society and to Act upon our Dreams. Being empowered simply means standing up for what you believe in and use your love power to inspire people to do good actions, moved by altruism, solidarity and willingness to make yours and others’ people dreams come true. Being human is quite complex, but if we listen to what our hearts and minds tell us to do, and- most importantly- we surround ourselves with peace-loving, peace-giving people- we can give and receive wise advice and continue to journey of life. These actions encourage young girls to be environmentally aware and more conscious about the need to protect the environment, our shared home, the planet, caring and loving it as if it was our cozy apartment. Moreover, the leadership and career talks are of extreme importance to give them role models, and the confidence to lead their lives, make the right decisions for the continuation of their studies and become who they wish to be in the future ( speaking about United Nations World Environment Day, many students want to become technology engineers, environmentalist and water engineers, Go girls!). It is about learning to believe, appreciate what you have, and work hard to achieve what you want. It is about investing, not giving up and taking charge of the world, succeeding in creating a more peaceful and sustainable future for this generation and the many more to come. Being aware of what surrounds us and of who we are give us the strength and the courage to move on, to create a more loving and emphatic world, channeling our energy into love for ourselves and love for others, when we cultivate and we plant the seeds for dissemination. Peace activities start in schools, with families, with teachers and with religious leaders. School administrators and policy makers then need to give the space and an enabling policy environment for culture, arts, peace-building, inter-faith dialogues, role plays and theater performances to take place and ensure that everyone can express themselves and instill in others a sense of belonging, peace and mutual understanding. Dialogue and Listening are key for effective communication to happen and for people to understand that Yes, we are different but Yes, we need to accept and embrace our differences because it is exactly where richness lays upon. Sharing and Embracing differences lead to collaborative ideas that shape the new world we are living in. I hope you can get inspired every day, by the people you meet, the places you see, the actions you or other people make, by the words you hear and the writing you do!